Local? Check. Sustainable? Check. Paleo? More Paleo than almond flour cookies, that’s for sure. Autumn is acorn season … not just for stepping on, for crafts, for throwing, or for the squirrels, deer, wild turkeys, jays, and weevils. They’re an excellent wild food source for Homo sapiens, and I encourage you to explore the almost-forgotten art of harvesting, processing, and consuming acorns. 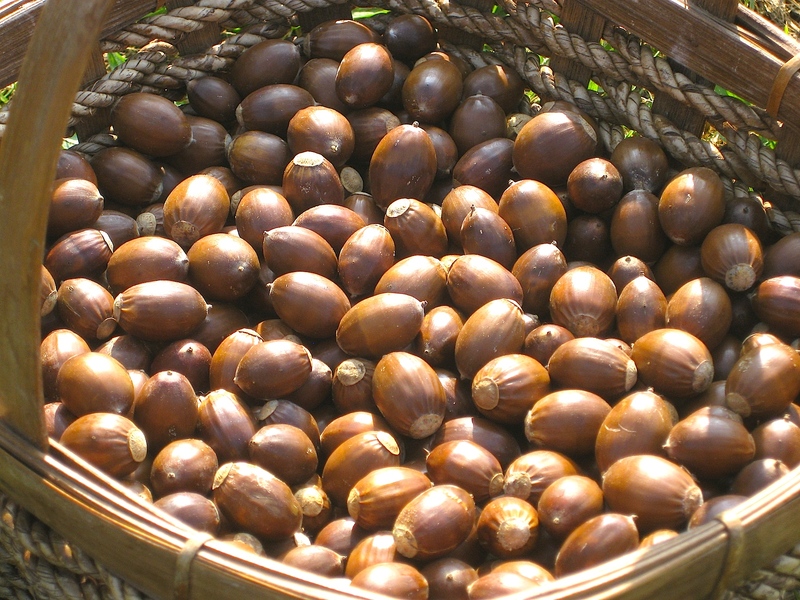 You can eat a few acorns raw … they provide a very astringent mouth feel due to the presence of tannic acids. If consuming large quantities, however, processing is the way to go for taste and health (that’s right, processed food can be good for you). This involves some variation of drying, shelling, grinding, leaching, and cooking. These are acorns gathered from the chestnut oak (Quercus prinus), a native tree common on dry, rocky slopes and ridges from central Mississippi to southern Maine. A member of the white oak group, the chestnut oak produces acorns that mature and germinate in a single season. These were gathered a few weeks ago before they had the chance to sprout (which they’re doing like crazy right now). Acorns will constitute a good portion of my winter calories, and I hope you’ll find as much pleasure as I do in harvesting, processing, and consuming America’s original superfood!